This seems like a good place to expand on my St Patrick`s day spread information for you. I find Instagram useful but not brilliant when I have `stuff` to say. I have had lots of questions about this spread so will endeavour to answer them here. 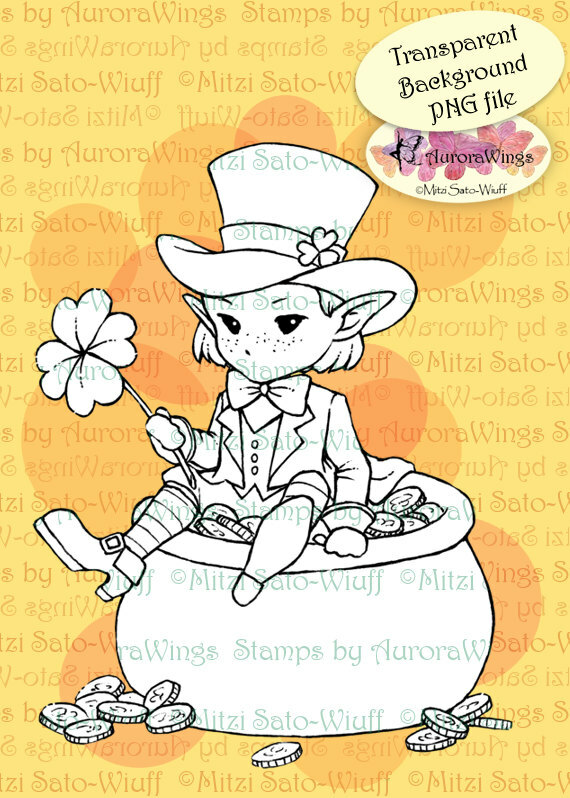 So here goes, the leprechaun was an image I found on Etsy by a company called Aurora Wings, the artist was somebody called Mitzi Sato-Wiuff. I really love this image, the face is just gorgeous…I am attracted to all things myth and magic although not all of them lend themselves to planner stamping. I do not have a huge array of stamps at home and many that I like are quite expensive, as they have to imported. Like Lindsay Ann Duyck I like the Stamping Bella designs but they are not readily available here in the UK. However, I do have two sneaky ones on order. In order to keep the costs down I have been buying digi stamps from Etsy and have downloaded some free line art from Deviant Art…I am quite fond of the designs by Jade Dragonne and YamPuff. Anyway I digress. Once the digi stamp images have been downloaded and saved to a computer they can be imported to any suitable programme and resized. 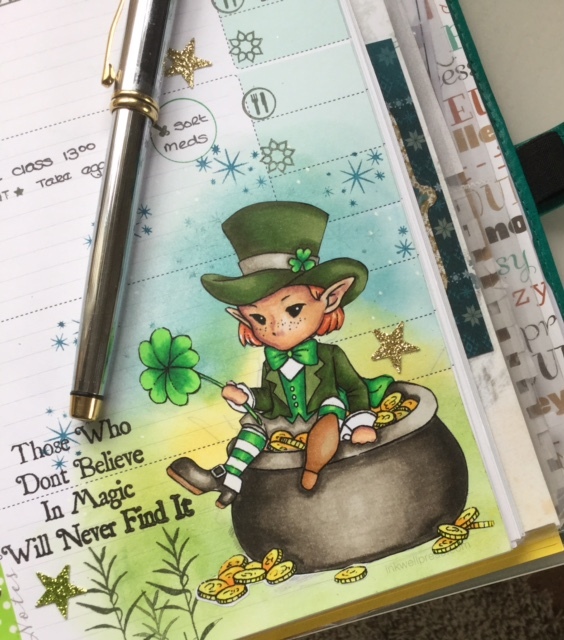 I am using word for this….the leprechaun is one of the bigger images I have used and this has allowed me to achieve more detail with the alcohol markers. In this instance I used Copics, although I do have Flex Markers and Chameleon pens. The image has been printed direct to sticker paper. Using the alcohol marker direct in to your planner is not to be recommended as they will stain through the subsequent pages. The background for this design was created direct on the planner page using dye based inks…for this I used Stampin` Up inks in soft sky and marina mist for blues, so saffron and daffodil delight for the yellows and garden green for the green, as I really wanted the clear colours for this design, and I already had them. I used a make-up sponge for blending these inks…I am a great lover of cheap and cheerful. You can also use a product called cut`n`dry foam, but it is far more expensive. In order to get the colours in the right place I traced around the leprechaun design with a pencil so that I had an idea where things would go. It was supposed to be very simple, green for the grass, blue for the sky and the yellow was supposed to be a glow from the gold. However, I didn`t think the yellow worked that well although it looked OK in the overall design. The stars and the leaves are from a company called Laviniastamps here in the UK. They make fabulous stamps…not necessarily for planners but do go and have a look. I really love their stuff and am fairly sure the quotation stamp also came from this company, they have some fabulous quotes. The stars have been applied to add a little definition, but also if I am honest to cover a few inconsistencies in ink blending. There are also some white dots in there that I applied using a white stamping chalk marker from stampin` up. 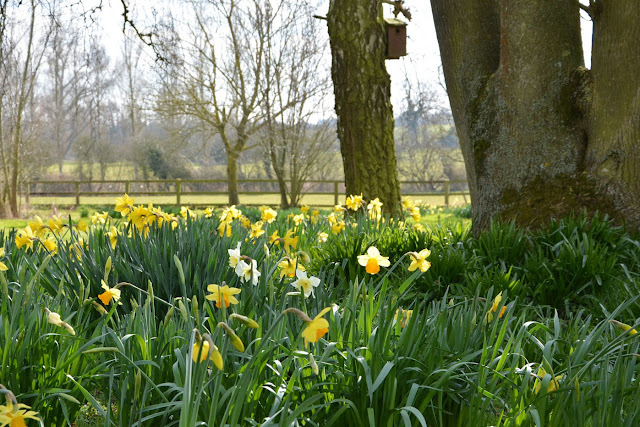 It is a very useful tool to add a little highlight to images. The raccoon is a lawn fawn stamp from the `party animal` collection. On reflection I should have swapped him out for another animal as I am not entirely familiar with raccoons and the colouring maybe a little dodgy. He was stamped direct to planner with black versafine ink and coloured using three shades of grey pencil from Faber Castell (polychromos). I also used a black pencil from Lidl...which should make the European planners smile. 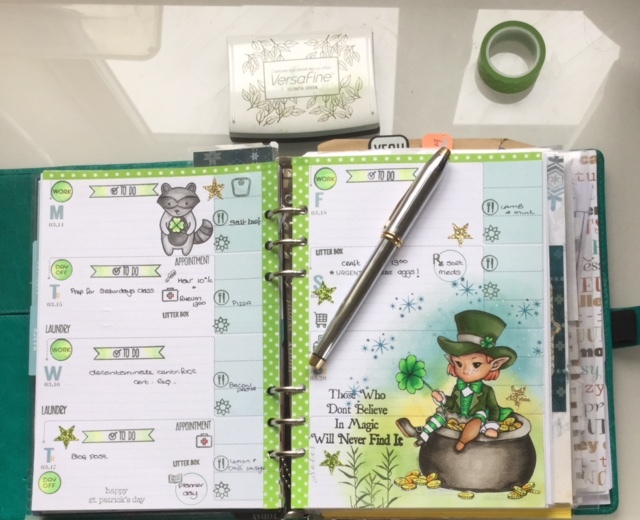 I have used a variety of planner stamps, most of which I am sure you will recognise and they were stamped with Versafine Olympia green. Studio L2E; I have the` plan it` and the `list it` set. They were the first stamps I got and are so versatile. Technique Tuesday; because they are readily available here in the UK. I love the circle `work` and `day off`…it is a shame they do not do a matching `sick` stamp as I am sure I would have use for it. The circle also lends itself well to colouring in. 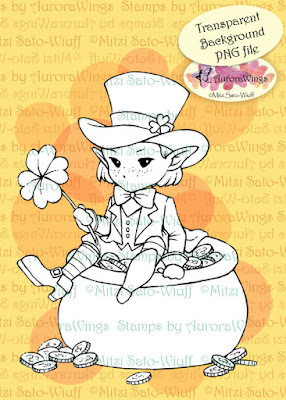 Tiny StampsBig Plans; these stamps are amazing…they really are tiny and the line work is so fine and detailed. I particularly like the planner for planner day and the flower shaped hydration tracker. The scales are lovely but they remind me that I need to track my weight, something I am not keen on facing up to J. Best of all shipping to the UK from Australia is very reasonable. Some of you asked about the black cat…he is a pencil sharpener and a source of great amusement. Great post. I love all the bits you've used. Your colouring on the leprechaun is fab. Thanks for all the links too. Congrats on your blog, Jo, this first entry is awesome. Cannot wait to see, what comes in the future.